Plant control innovations and developments that enhance three key components of the AutoCook™ confectionery cooking system were introduced by Baker Perkins at Interpack (stand 4C21). The upgraded AutoCook™ modules were the Autofeed ingredient weighing and mixing system; Microfilm™ cooker; and Colour and Flavour Addition (CFA) system. Baker Perkins confectionery depositing technology was represented with a twin-headed depositor and lollipop stick insertion system. 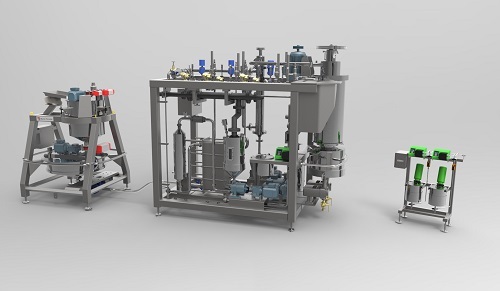 Upgraded monitoring and control technology means that the entire process, from ingredient mixing to depositor discharge, is now fully integrated and automated. Additional sensors and actuators in conjunction with the latest hardware and software help to reduce set up times and improve efficiency. Operators can control the entire line from a single HMI that includes full process visualisation, recipe management, calibration and alarm handling. A fully functioning demonstration of the control system was on the Interpack stand. The Autofeed system automatically weighs and mixes dry and liquid confectionery ingredients into a homogeneous slurry. Separate vessels with associated pump, valves and pipework have been consolidated into a single skid-mounted system that requires less floor space and reduces installation time. The hygiene, energy efficiency and ease of maintenance of the swept thin-film Microfilm™ cooker have been improved. All the quality and consistency benefits of the Microfilm™ cooking process for hard candies, cream candies and high milk candies have been retained. The machine on show at Interpack featured a twin outlet for feeding depositors with two hoppers, and an integrated pressure dissolving process that reduces energy and water consumption. Other energy saving features include an indirect condenser to minimise cooling water consumption, and systems to recover energy from flash steam and flash vapour. The Colour and Flavour Addition (CFA) system accurately meters quantities of colours and flavours for mixing into the cooked syrup, between the Microfilm™ and depositor. Accurate metering ensures consistent product quality and reduces costs by avoiding excess addition rates. Incorporating colours and flavours into the syrup at the last minute minimises evaporation losses and allows rapid ‘on the run’ changes. The CFA is modular and comprises a pair of holding tanks with a peristaltic metering pump and associated mixing, heating, recirculation and instrumentation option. Multiple CFAs can be combined into a single system to suit the number of colours and flavours required on a line. All the AutoCook™ modules comprise one-piece stainless steel frames with good access for maintenance from outside. Hygienic design and components are used throughout and there is easy access for cleaning. All the modules include a full range of sensors and actuators for fully automatic operation and the control system includes a washout programme for the Autofeed and Microfilm™. The Baker Perkins ServoForm™ range is the recognised market leader for deposited hard candy and lollipops, soft candies, toffees, caramels and jellies. The quality, consistency and output that can be achieved with depositing exceed anything possible with other processes. These advantages may be enhanced by using twin head depositors offering increased output and/or greater product variety. Twin-headed depositors can be applied to achieve high capacity production using the heads in parallel; or produce two categories of layered products using them sequentially. There was also a demonstration of the fast, automatic cleaning cycle that is a standard feature of the ServoForm™ depositor. This replaces time consuming manual cleaning: the washout system is placed and withdrawn automatically and the washing and flushing cycle is pre-programmed and carried out with no operator intervention. The automatic lollipop stick placer inserts sticks accurately and consistently into flat or ball lollipops and ensures they remain perpendicular until the lollipop has set: this patented system minimises labour costs and waste.